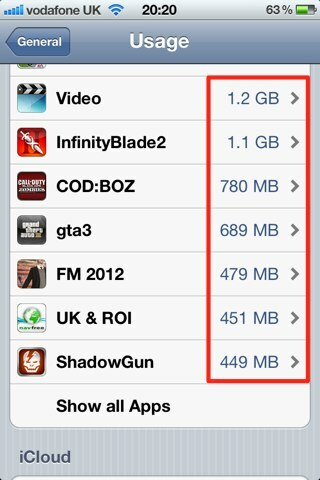 When we install new apps on our iOS devices, they don’t just take up the storage space needed for the app itself, but they also consume space needed for storing “documents & data.” This can be all sorts of things, including save files for your games, pictures, videos, and content downloaded through in-app purchases. Here’s how to see how much storage space each of your apps is using for “documents & data,” and how you can reclaim that precious space. 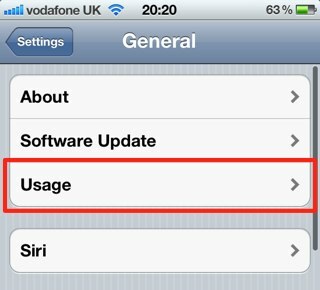 First, open up the Settings app on your device, then choose ‘General’ and ‘Usage’. You device will present you with a list of apps you currently have installed, and tell you how much storage space they’re consuming in total. This figure includes both the storage space needed for the app itself, plus the space consumed on additional documents & data each app has collected. To get a better understanding of how each app is using your storage space, simply tap on its name. 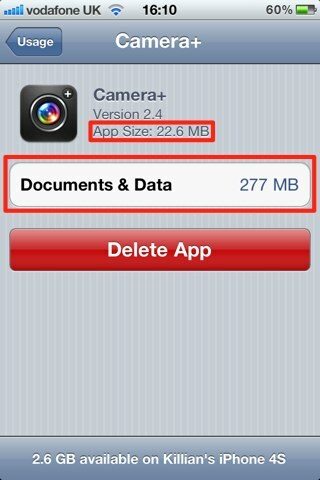 In the screenshot below, you’ll notice that the Camera+ app itself only takes up 22.6 MB of the storage on my iPhone, but all the photos I’ve taken with the app are using up 277 MB. So how do you free up that space? Well, first you need to work out what “documents & data” consists of. 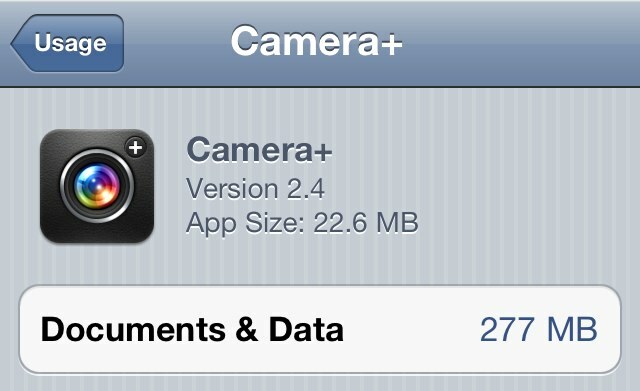 Because Camera+ is a photography app, I know most of that space is used up by photos. So to free it up, I can delete the photos I no longer want, and sync those that I do want to my computer before removing them from my iPhone. With games, such as Football Manager 2012 seen below, storage space is likely to be spent on save files and additional content downloaded through in-app purchases. 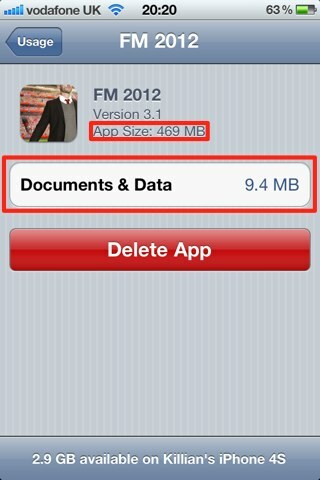 Some titles may allow you to delete these, others will require you to delete the app itself, and then reinstall it. While most apps only consume a small amount of storage for “documents & data,” others — like Camera+, will consume a lot, and it all adds up. Keeping on top of that data and deleting files you no longer need will help you keep your consumption down.